The prominent social activist said India has topped the list of corrupt countries in Asia in the last three years of the NDA rule. GUWAHATI: Attacking the Narendra Modi government at the Centre, prominent social activist Anna Hazare on Friday said the country has topped the list of corrupt countries in Asia in the last three years of the NDA rule and claimed that Rs 80,000 crore has come to the coffers of the BJP in the last five months as donation. Hazare, citing a Forbes Magazine article that quoted a Transparency International survey, said India tops the list of corrupt countries in Asia. "I am not claiming this but it being reported by Forbes Magazine after conducting a survey among the Asian countries," he said. "I have been silent for the last three years. When a new government comes we must give them some time. So I remained silent, but now the time has come to speak against them. I am going to start another movement for a strong Jan Lokpal as well as for the farmers of the country from March 23 next year," said Hazare. Slamming the Centre, he said that Rs 80,000 crore had come to the coffers of the ruling party in the last five months as donation. "The common people are still reeling under problems. The farmers of the country are suffering. Banks give loans to the farmers but slap interest as per their whims and fancies. The Reserve Bank of India must fix a rate of interest for all the farmers and banks should not be allowed to fix the interest for the benefit of the farmers." "The farmers commit suicide as they fail to get good price for their crops to repay the loan. There is no MSP for their paddy," he said while expressing his concerns. He said he had written 32 letters to Prime Minister Narendra Modi in the past three years but received no response to any of them from the PMO. "I am going to involve everyone in the movement for a strong Jan Lokpal and farmers' issues. I am going everywhere to speak to the people. We are ready to go to jail. But if they put us in jails we must ensure that every jail in the country should be filled by people," said Hazare. The veteran leader said while the then UPA government under the leadership of Prime Minister Manmohan Singh made a weak Jan Lokpal, the present BJP-led NDA government has further weakened the Jan Lokpal. "Earlier there was a provision which made it mandatory for the officers to declare their assets but the present government abolished it. 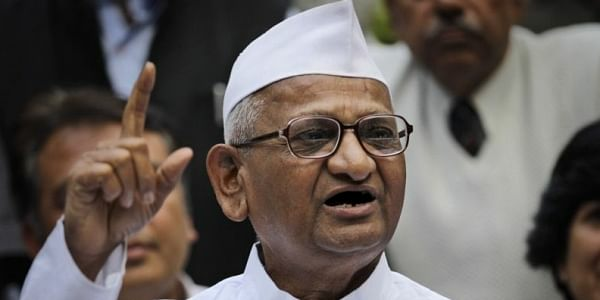 While the companies were allowed to donate 7.5 per cent of their profit to political parties, now any amount can be donated to the political parties," said Hazare while appealing to people to support the movement to be started from March 23.